The right hand side looking forward; it can be seen that all brake hangar brackets are now riveted in place. 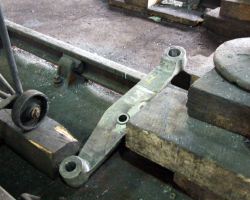 Not seen is that all twelve spring hangar brackets between the frames are also fully and finally riveted to the frames. The area around the Right hand driving horn gap. 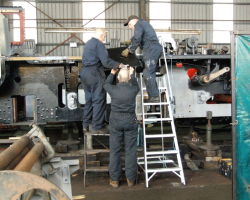 On the running plate above, the second mechanical lubricator, for the coupled axleboxes, is temporarily fitted to allow its location holes to be drilled in the new running plate surface. 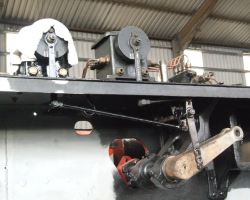 Below it, the drive linkage to the lubricators is also trial fitted; the lower end of the long vertical arm connects to a lever on the expansion link spindle. Much of the grey primer would be over-painted in black undercoat by the end of the day. 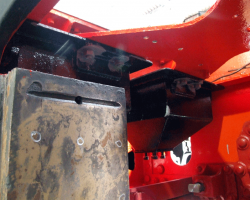 Close up of the drive linkage to the lubricators. With their brackets fitted in place, all newly rebushed brake hangers have been trial fitted; this is the right trailing one. They have been removed again as, very obviously, the painters need access to both sides. 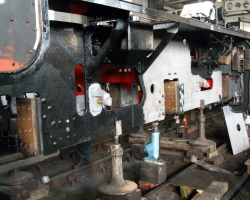 New sections of running plate for above the trailing sandboxes have been fitted in place. They are heavier than they appear, and three of the Fund’s working party manhandle that for the right side into place. Once in place, this particular piece proved to be about 3/16 inch (4.75mm) too long so had to come down again. 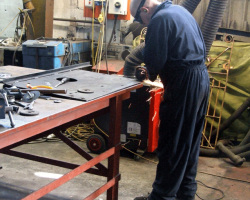 A Fund member is making the necessary adjustment with the angle grinder. The leading sandboxes have been refitted between the frames below a horizontal stretcher. The large item lower left is the front horn face of the Left hand leading horn gap. The odd bits of grey where paint was damaged will receive the finishing coats of black in due course. 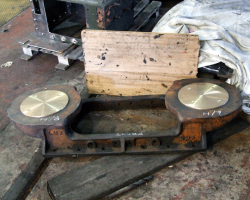 Parts for painting, the piece at the front is the Left hand cab stanchion. The long, thin black rod behind is the drive rod to the linkage below the mechanical lubricators and connecting to the expansion link; the coil spring is to balance the reverser weighshaft. 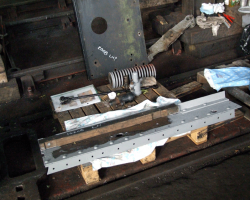 More parts painting: another Fund member tackles one of the cab doors. The axleboxes, all with new white metal. 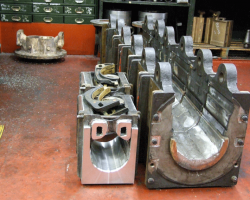 The pony truck boxes, left, have had their white metal bored to size.. The pony truck has been fully cleaned and degreased and painting begun. Most parts have been taken away for refurbishment. 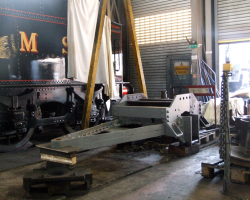 The slide assembly is in the lower left corner, while our tender is in the background. 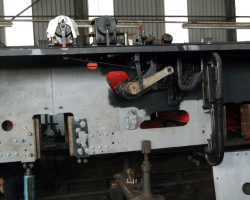 The truck’s top housing, showing the new surfaces on to which the spittoons transfer the loco’s weight fastened in place. 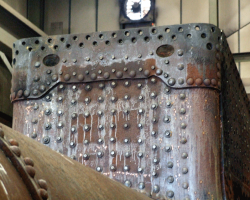 Meanwhile, in the boiler shop, one patched part of the boiler assembly which survived the non-destructive testing was the lower front throatplate, the patch seen here. Despite this, it has been decided to renew the metal behind, thereby eliminating the patch. 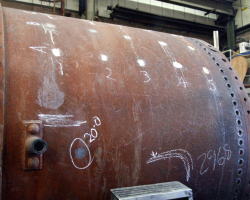 The metal thickness of the front barrel ring is also to be measured ultrasonically. What appear here to be white patches are actually bare metal where the surface rust has been ground away for the tests to be made.